Early last month, Mikki posted about Romeo’s leg injury. It was a surprise that we discovered a little later than we should have. Infections are much harder to treat than fresh wounds. In fact, we ended up treating that infected wound for 35 days. Of course it was smack in the middle of winter, mild though it was. Romeo learned to dread coming to the barn about as much as we did but the bandages had to be changed twice a day at times and the wound cleaned and treated and then re-wrapped to keep the dirt out (we used blue camo horse wrap, like the one in the picture). The antibiotic pills weren’t pleasant, even when we crushed them into something yummy like molasses or apple mush or a sweet oatmeal cake. It didn’t take long for him to be on to us. But considering the pain and unpleasantness of it all, he took it well. We usually cross tied him in the barn. He mostly stood quietly. Having two of us work on him was key. One of us talked to him and rubbed his neck, delivering a needed distraction. He never kicked or bit, though he did try to walk away at times. 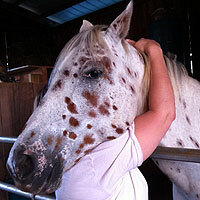 Today, Romeo is still not very interesting in coming to the barn, despite the treatment being over. But he walks and runs well and the wound has healed nicely. Moral of the story? Check your horses every day! Any kind of stiffness or limping needs immediate attention. And if your horse has any kind of open wound injury, expect to treat it several times a day and don’t skimp on cleaning, even though they hate that part. Also, seek medical attention immediately if you have any concerns. Develop a relationship with your horse vet because these things almost always seem to happen late at night on a Friday or Saturday when it’s hard to reach a vet until Monday. We have our vets cell phone number just in case. Camo horse wrap picture from The Haughty Horse. 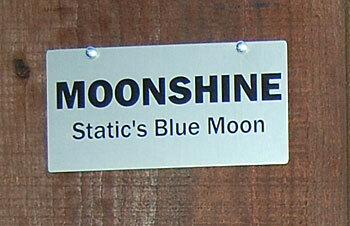 About four years ago we wrote a post about barn names called Curiously Fun Barn Names. Since then, that post has had a lot of comments revealing some really interesting ones. The thought occurred to me that we ought to run a survey of barn names with a few questions such as age and location so we could see if there are any geographical trends. You’d also be able to pick your favorite barn name from those suggested so far. Want to participate? This is all just for fun so there’s no need to identify yourself. I did include an email field in case you’d like to get an email with the results. Depending on how popular it is, I’ll keep it open for a while and will then report the results here on our blog. Sometimes I wonder if I’m meant to have horses. Given my tendency to clumsiness, maybe not. Here’s the latest: On March 26, just as the days were getting warmer and the fields were getting greener, and Bill and I were looking forward to washing all the winter mud off our horses and saddling them up again, I broke my foot. I wish I had a cool story – maybe something involving a rodeo and finally giving Moonshine her day in the sun – but the sad truth is, I slipped on a used puppy pad. Yep, that’s it. We have an old dog in kidney and liver failure who is a bit incontinent, so we keep puppy pads by the back door. I hadn’t picked one up out of sheer laziness; I stepped outside, over it, to let the littlest dog out, and when I stepped back in, I forgot all about the darn thing and stepped right on it. Turns out they’re pretty slippery. We went to the emergency clinic (it was Saturday, of course – all emergencies happen at night or on weekends) and the PA on duty said it was just a sprain. On Monday the radiologist called and said it was definitely more than a sprain. 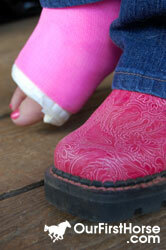 By Wednesday my foot was in a pretty pink cast and I was on crutches. (After about a week on crutches I switched to a knee walker – a wheeled walker you put your knee on like a scooter. Much better than crutches!) I wasn’t allowed to put any weight on that foot until the orthopedic doc gave me the okay on April 27 – now I can stand on it (on both feet, not just that one) but still can’t walk on it. The doctor says at my next appointment I may get the okay to walk on it. Two months off the foot all together. Two months of SPRING. What bad luck! And you’ll note it was my right foot…no driving. I also cannot go anywhere with uneven ground: for instance, to the barn. I certainly can’t go into the barn with a horse, since I wouldn’t be able to maneuver out of his way if necessary. Can’t feed them or water them or even pet them! Poor Bill has had complete responsibility for all the farm chores all this time. Except when he traveled on business, then my poor dad had to take over. I never thought I’d miss feeding horses in pouring down rain, or shoveling stalls, or scrubbing buckets…but I sure do now. I can’t wait to be on two feet again. Even after I’m allowed to walk again, I suspect I’ll baby my foot for a while and probably won’t be riding for another month to be sure. If any of you have broken a foot or leg, I’d love to hear your recovery story/advice.